If you’re like me, fumbling around the supermarket looking for obscure items is a pretty common—and frustrating—occurrence. Lighting giant Philips has developed a solution: smart lights. 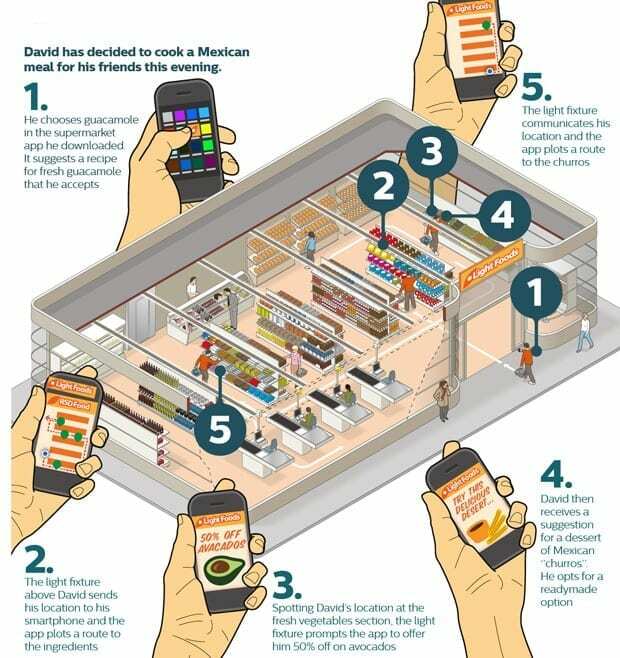 The company yesterday introduced a system that connects in-store LED lights with consumers’ smart phones. Using a downloadable app, people will be able to locate items on their shopping lists or get coupons as they pass products on the aisles. Retailers can send targeted information such as recipes and coupons to consumers based on their precise location within stores, while gaining benefits of energy-efficient LED lighting, says Philips. “The beauty of the system is that retailers do not have to invest in additional infrastructure to house, power and support location beacons for indoor positioning. The light fixtures themselves can communicate this information by virtue of their presence everywhere in the store,” said Philips Lighting‘s Gerben van der Lugt in a statement. The company is demonstrating the retail lighting system at the EuroShop retail trade show in Düsseldorf, Germany, this week. Philips is already testing it with an undisclosed number of retailers. The system uses Visual Light Communications (VLC) to talk with consumers’ smartphones. Unlike the wireless protocols Wi-Fi, Bluetooth, and Zigbee, which use radio waves to send information, VLC relies on the store lights to transmit data to the camera on a smart phone in fast pulses. The lights blink at frequencies that are undetectable by people, according to LEDs Magazine. There are already a number of other efforts aimed at adding communications and sensors to LED light fixtures. Last year, researchers at the University of Strathclyde in the U.K. demonstrated LED lights with optical communications, which they call “Li-Fi.” That setup was able to operate at gigabit-per-second speeds, according to a BBC article. Startup ByteLight has developed a system similar to Philips’ retail lighting network. It also uses light pulses to communicate with consumers’ smart phones in stores. Other companies, such as Silver Spring Networks, in Redwood City, Calif., have developed street lights with sensors and radios that allow city managers to remotely monitor traffic density or air quality. April 18, 2019 - Clear Blue Technologies' Smart City Lights Replace The Grid In Long Island Project GlobeNewswire20 Illumient Smart Off-Grid lighting systems replaced electric grid lighting on a parking garage roof in Hicksville, New York. April 16, 2019 - How to get started with Philips Hue: Bulbs, fixtures, accessories and lots of colors CNETFrom fancy, multicolor fixtures to surprisingly affordable white-light LED bulbs, here's everything you need to know about the biggest name in smart lights. April 18, 2019 - Annual Smart Street Lighting Revenue Will Grow 10-Fold to Reach US$1.7 Billion in 2026 Associated PressPress release *content* from Business Wire. The AP news staff was not involved in its creation.